It's been nearly 25 years since Ethiopia's Soviet-backed Derg regime was ousted. As a coalition of rebel forces approached capital city Addis Ababa on May 27, 1991, four senior ministers — accused of ordering mass killings — used the darkness of night to creep into the Italian embassy. What followed is a tale of suicide, murder, and decay. The reaction of the guard who first met the group at the gate, the identity of the person who ushered them in, is uncertain. What VICE News can be sure of is that two of the former Derg officials remain there, while the other two died inside the high walls of the embassy. In 1993, one of them — former acting Prime Minister Hailu Yimenu — killed himself. Eleven years later came the death of former Minister of Defense and Military Commander in Eritrea Tesfaye Gebre Kidan — allegedly murdered during a "brawl" by fellow official Berhanu Bayeh, former foreign affairs minister and close supporter of Derg leader Mengistu Haile Mariam. Making Julian Assange's three years in London's Ecuadorian embassy seem like a short vacation, VICE News has confirmed that Bayeh, along with former Derg Chief of General Staff Addis Tedla, remains inside the Italian embassy in Addis Ababa to this day. Fifteen years into their stay, the remaining two men were reportedly sentenced to death for their role in the killings. 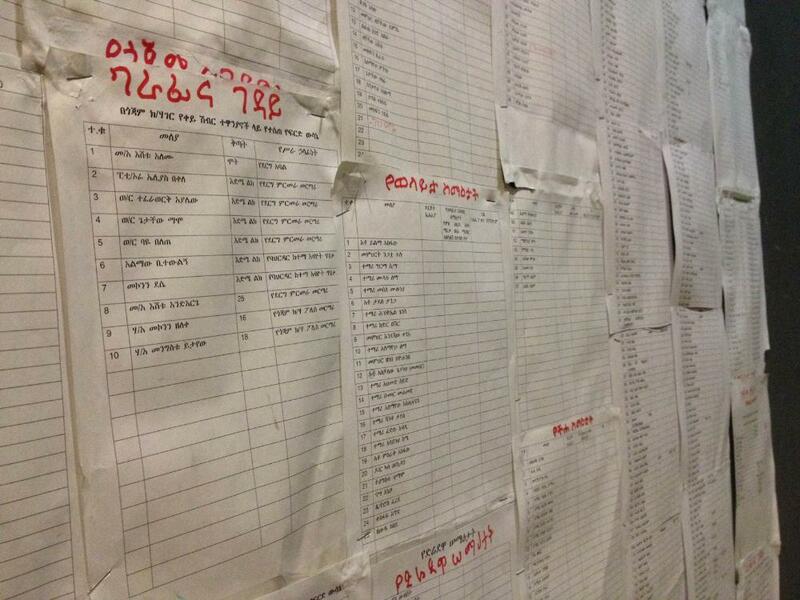 In 2011, 23 death sentences for former Derg officials were commuted to life imprisonment. However, the men in the embassy — now in their 70s — remain in self-imposed incarceration, but otherwise unpunished. In a statement issued in 2004, Italy said they would not hand the two former Derg officials over and said that the Ethiopian authorities are well aware of the position of Italy on this issue. Eleven years later, Italian officials have again confirmed this stance to VICE News. "Given the nature of the issue, we have always preferred not to grant interviews with journalists, rather we have privileged to have an open channel of communication with human rights institutions and NGOs," First Secretary Giuliano Fragnito said in an email. "I confirm that within the embassy compound there are two former senior Derg officials and that the Italian government cannot force them to go out from the compound (which according to international customary law is Italian territory) as long as they risk capital punishment. This obligation is enshrined in our legal system." Fragnito also told VICE News that the two Ethiopians had never been granted asylum, and that they didn't have a lawyer as far as he was aware. VICE News approached the Ethiopian government for a statement on the case, but hasn't received a response. Meanwhile, Tedla's wife and children have reportedly relocated to the United States. In 2004, they appealed to the US to help him, though it didn't appear to be an American priority at the time. Approached for comment by VICE News, Felix Horne, Ethiopia and Eritrea Researcher at Human Rights Watch (HRW), said he wasn't following the specifics of this case closely but noted that there would still be "all kinds of due process concerns" if the men were to leave. In the two-and-a-half decades since the men's self-imposed incarceration began, Ethiopia has experienced rapid change. Saudi, Yemeni, and Chinese investment is evident everywhere in the capital — in the masses of half-finished concrete constructions outlined by wooden scaffolding, in the suggestively named Ethio-China Friendship Roundabout, in the increased number of upscale coffee cafes and cocktail bars. This is a conference city — the headquarters of the African Union, the setting of the South Sudan peace talks, and the home of sub-Saharan Africa's first electrified train service. A hotel room in Ethiopia's capital costs many times the price of one in the country's more rural areas. These developments are reflected in economic measurements. Ethiopia is expected to be the world's fastest growing economy in the four years to 2017, according to the World Bank. However, advancement has come with a price. Labeled a "police state" by international political analysts, Ethiopians are suspicious of any perception of freedom in their country — whispering about censorship, tight control of the press, and the "spying technology" that the government is rumored to have been given by China. In this year's election the ruling party won all 546 parliamentary seats; in 2010 it received one seat less, but claimed 99.6 percent of the total vote. Foreign media have referred to the government as a "corrupt regime." Local journalism is heavily controlled, with Ethiopia this year one of the world's biggest jailers of journalists, according to HRW. US President Barack Obama's visit earlier this year caused an outcry, as human rights workers condemned him for legitimizing a questionable leadership. The aid and military support given to the Derg junta by the Soviet Union meant Ethiopia was marked as a Cold War battleground. Emperor Haile Selassie's government lost power in 1974, following a famine. That was when the committee of military professionals, known as the Derg, took over. This group quickly ordered the execution, without trial, of 61 ex-officials of the ousted imperial government — a command that was carried out on November 23, 1974. Selassie himself was killed in 1975. The body of the king, who had inspired a devoted following, was buried under new ruler Mengistu Haile Mariam's offices, some say beneath a toilet. The Derg proceeded to enact a series of reforms, including nationalizing rural land, banks, and insurance companies, and began a program that sent tens of thousands of students to rural areas to teach, thereby removing any revolt-ready youth from the centers of power. These acts were accompanied by a period of mass murder, named the Ethiopian Red Terror in reference to the Red Terror of the Bolsheviks. Many of the Derg's victims during this time were students who supported the Ethiopian People's Revolutionary Party (EPRP). Parents of the dead were forced to pay militias the cost of the bullet in return for their child's body. As many as 500,000 were killed during the Red Terror period between 1977 and 1978, according to estimates by Amnesty International. While the violence eventually calmed down, the Derg's 10th anniversary coincided with the 1984 famine — itself publicized globally by Bob Geldof and Live Aid and largely believed to have been exacerbated by mismanagement. After the Derg eventually lost power in 1991, the new Ethiopian government conducted a 12-year-long war crimes trial which concluded in 2007. Described at the time as an "African Nuremberg," spectators traveled hundreds of miles to see their former oppressors brought to justice. Trials took place in the Ministry of Central Planning in Addis. The Derg trials were unique because they were conducted domestically in the local language of Amharic and with limited international influence, and they possibly suffered as a result. Lacking the credibility of an independent international tribunal, they also ended up marred with allegations of unfair trials and human rights abuses against prisoners — many of those charged were held in pretrial detention for years until they were released because the prosecution lacked the evidence to charge them. While there were more than 100 Derg members, when the trials began in 1995 only 44 stood trial, including eight of the 12 members of the standing committee. They stood accused of the murder of Selassie, of the Patriarch of the Ethiopian Orthodox Church, 59 members of the imperial court, nearly 2,000 members of rival revolutionary groups or supporters of the emperor, and charged with crimes against humanity and genocide (for political reasons), aggravated homicide, abuse of power, and unlawful detention. Mengitsu himself was condemned in absentia. He has been in Zimbabwe since May 21, 1991, after fleeing in an airplane under the pretext of visiting a military training camp. The former leader was received as an official guest of President Robert Mugabe and has since been granted asylum. Zimbabwe said that this was repayment: Mengitsu and the Derg regime aided Zimbabwe in its own "struggle for independence." Mengistu still lives in a Harare suburb. Addis Ababa's "Red Terror" museum, located off historic Meskel Square and reportedly home to a portrait of Karl Marx in the Derg days, holds stacks of skeletons — some paired with names, photos, and belongings, others methodically separated into glass boxes by bone type. Almost all of the guides working in the museum — which opened in 2010 — were tortured themselves and many still bear the marks, such as missing toes, scars from burns, and lacerations inflicted by whips. A visitor to the Red Terror museum is left with a feeling of horror, but critics condemn the display as an over-simplification. "A museum is set up after every president," one Addis Ababa University music student said disparagingly outside the building, before dismissing much of the exhibit as "propaganda." "The museum tells a kind of simplified story of what the trials did tell," said Jacob Wiebel, an academic who lectures in African history at the University of Durham. "[In the trials] the story that came out was much much messier. In the museum the struggle of the Red Terror's urban victims is not clearly differentiated from that of the guerrillas that formed today's government." 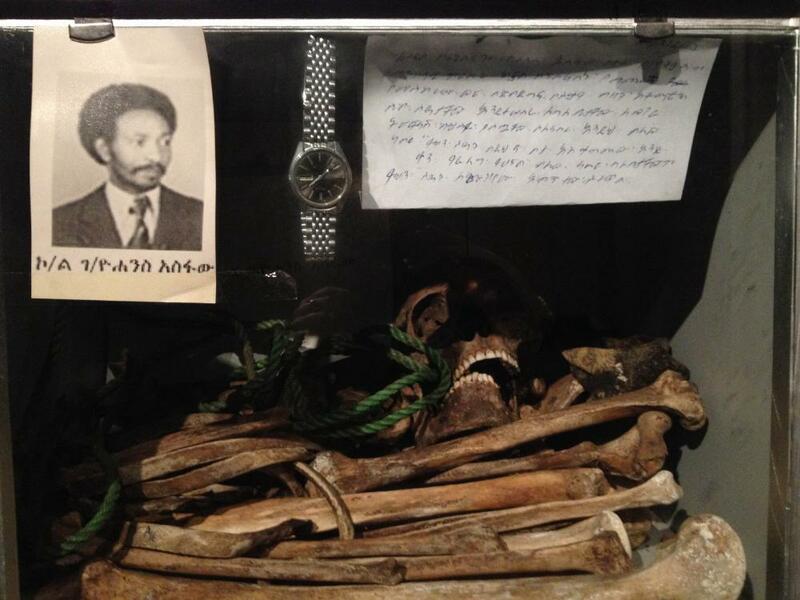 Wiebel recently completed a PhD on the Ethiopian Red Terror period. On the the subject of the fugitive Derg officials he said: "The one thing that really intrigues me is the allegation that one of them murdered the other one in the embassy, which no one has verified but if that happened it's technically a murder on Italian soil that has had no consequences." Wiebel also commented on the Derg trials: "I think there was a lot of goodwill and intentions but the funding and capacities of the prosecutions was very below par. Most of the judges had been deposed because they worked with the old regime. Small team, very little money." He added: "One of the frustrations was that less than 50 percent of people who were sentenced were present." Wiebel also noted that while Italy's reasoning for not forcing the men out was avoiding the death penalty, many of the initial death sentences given to Derg members have been reduced to life imprisonment. "They'd go to jail for sure but it is highly unlikely that they would get the death penalty," Wiebel said. Italy colonized Eritrea and occupied Ethiopia — the impact of which is still obvious. Most local restaurants will serve pasta and pizza, putting spaghetti carbonara on the menu alongside traditional national meat and vegetable dishes such as shiro, kitfo, and tibs. Wiebel observed that the relationship between Italy and Ethiopia is now "very cordial" and "centered on development and lots of development assistance." When VICE News visited the neighborhood of the Italian embassy in September it was the tail end of rainy season, and thunder rumbled overhead. A lengthy sloped road stretched along the land's left flank for nearly half a mile. Children emerged from metal shelters to stretch out a hand and cheekily ask the foreigner for money, while teenage boys oblivious to the wet weather kicked a soccer ball. A baby cried. Smoke rose above the corrugated iron sheets being used as walls by the embassy's neighbours. Signs on a side gate informed visitors in English, Italian, and Amharic of the best way to apply for a study visa (make sure your parents agree to fund your living costs) and the correct time that Eritreans should arrive for appointments (8.30am on Tuesdays). Towering trees loomed high above the embassy's barbed-wire topped stone walls, and every entrance was watched closely by multiple CCTV cameras. 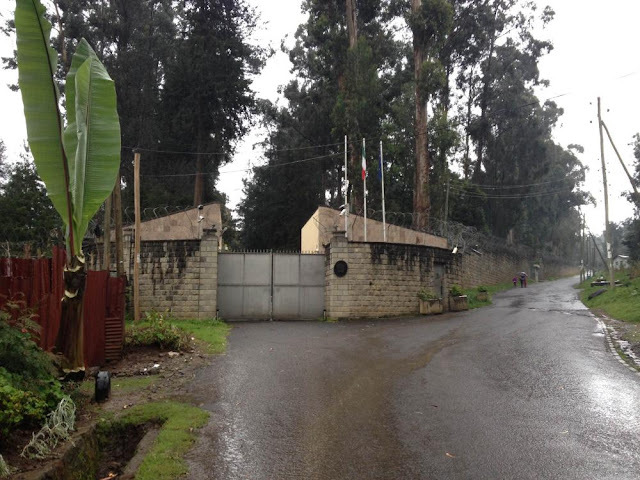 Later, an Italian national living in Addis Ababa — who has been to the embassy several times — told me she was "surprised but also not surprised" to hear that former Derg ministers still lived inside. She said the embassy itself though is rather unremarkable, and that sometimes the diplomats hold horse-riding competitions. "Our government has a lot of things they are hiding too. There are a lot of things in our past that we do not know."